But what is balance anyway? It could be argued that work life balance doesn’t really exist, especially in the early stages of a career or a business, when there are lots of hours that need to be put in. 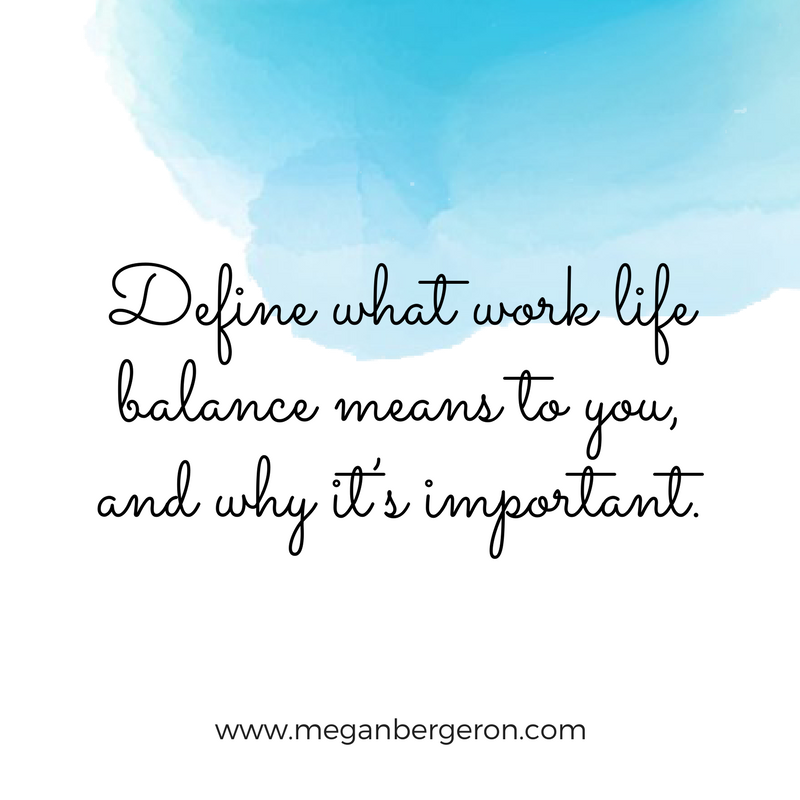 The thing is that work life balance isn’t necessarily all about how many hours you spend working vs. doing other things. It’s a sense of peace, joy, and presence in the things you’re doing – whether that thing is work or the other things that matter to you. There are things that we can do to help achieve that feeling of balance in our lives. 1. 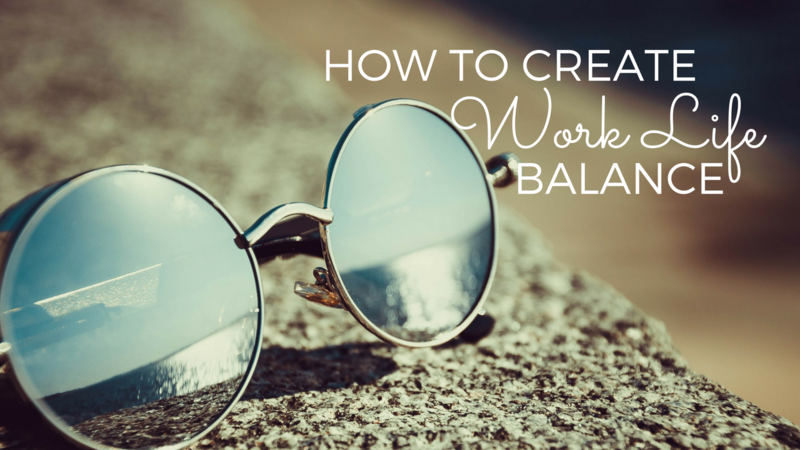 Define what balance means to you, and why it’s important. Grab a piece of paper and write about what kind of life you want and why. Be really specific with this. Is it spending more quality time with your family and your spouse, or taking more time to take care of yourself? Maybe it’s less about time and more about doing work that you love instead of the work that makes you unhappy. That’s a huge part of feeling balanced! 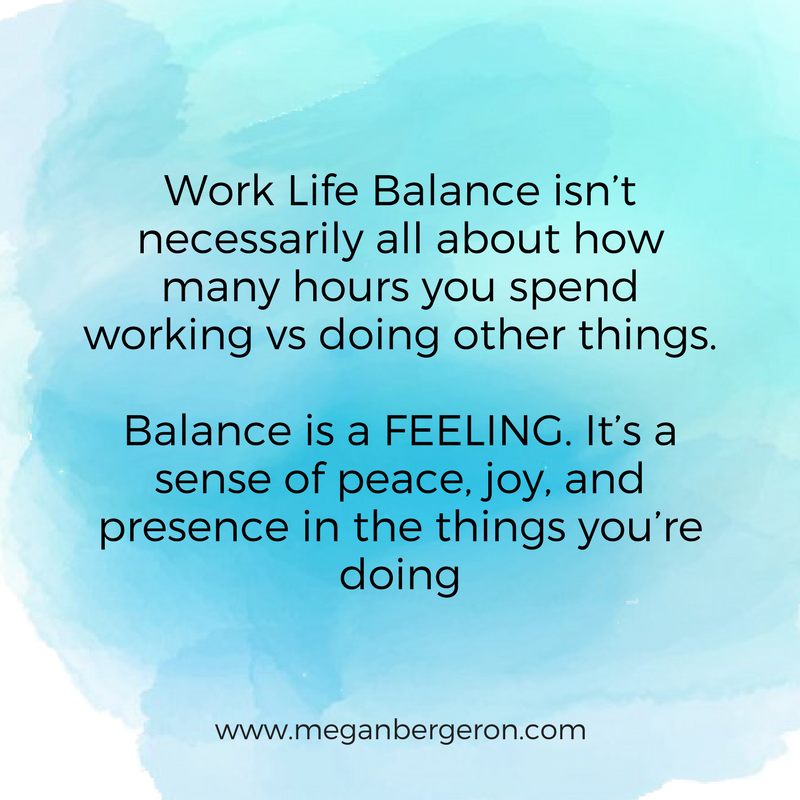 You could have a great balance of time in your life between your work and the other things you want to spend your time on, but if all your work time is spent doing something that makes you miserable, it’s really hard to get to a feeling of peace and joy! Once you’ve defined those things that are important to you, set specific goals for yourself and then work to achieve them. Create boundaries around those things so that you can make them non-negotiable. 2. 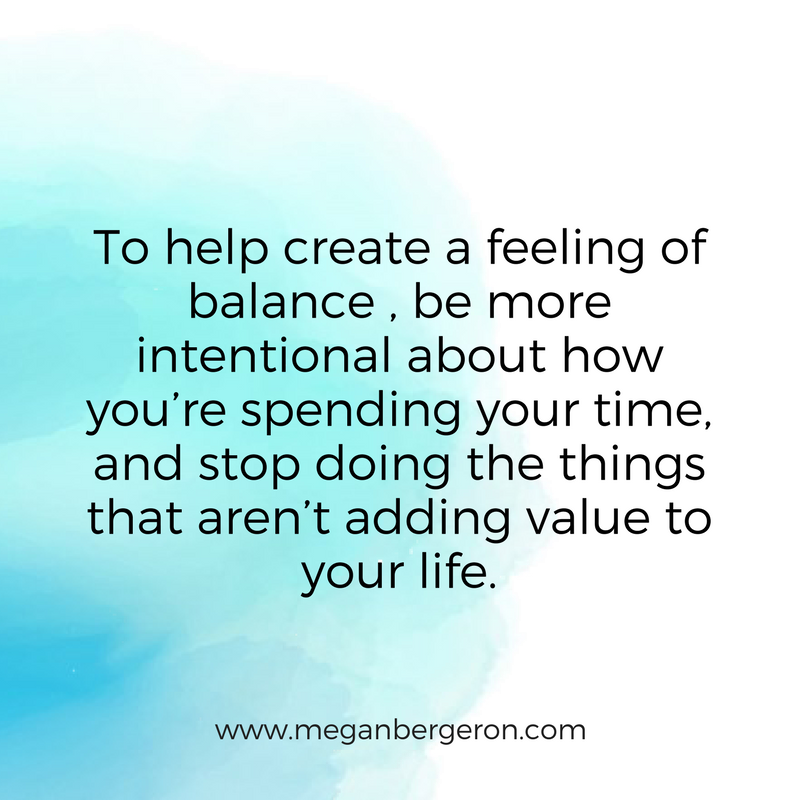 Be more intentional about how you’re spending your time. You need to stop doing the things that aren’t adding value to your life. You need to protect your time, and once you’ve created boundaries to protect the things that really matter to you, it becomes easier to do that! Have a schedule for how you spend your days. Plan when you’re going to start working, and when you’re going to stop, and then really stick to it. When you’re transitioning from one activity to another during your day, it makes a huge difference to take a couple of minutes to breathe and let go of what you were just doing so that you can move into the next phase of your day. This will help you to avoid carrying your work into other parts of your life so that you can be more present instead of distracted and preoccupied. 3. Eliminate distractions. This really builds on being intentional about how you’re spending your time. Most people waste hours on things like social media and watching TV. Don’t get me wrong, downtime is good and is part of feeling balanced - but be mindful of whether indulging in those things is really creating the kind of downtime you want, or if it’s taking away from other more valuable things you’d like to be spending your time on. When you’re working, really focus on what you’re doing, and be as productive as you can so that you’re not spending more time on your tasks than you should. That leaves you more time for other important things in your life. 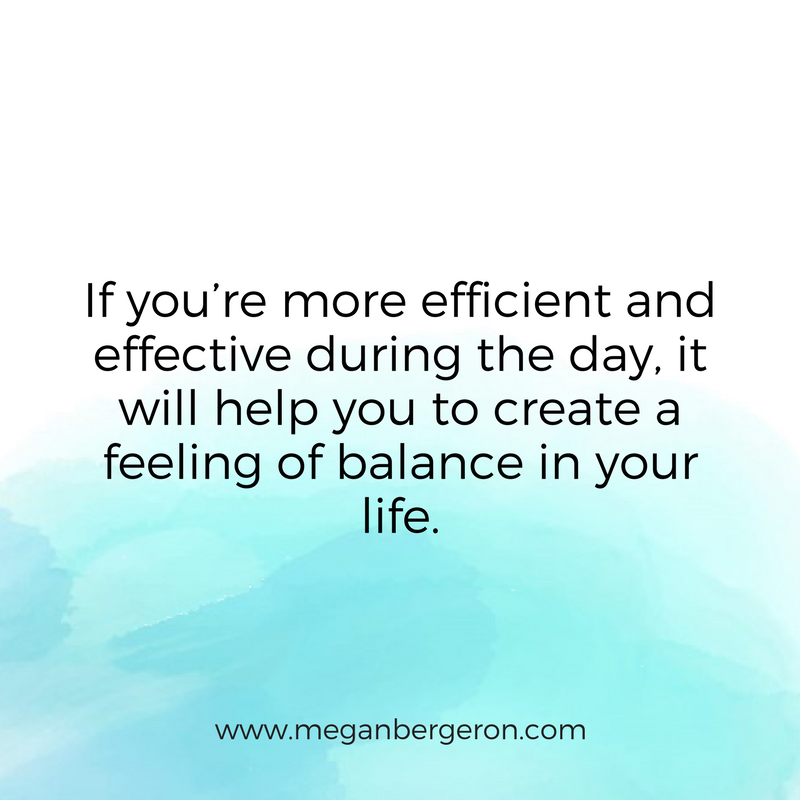 If you’re more efficient and effective during the day, it will help you to create a feeling of balance in your life. Click here for some tips for how to stay focused, and making the most of your time while you’re working. 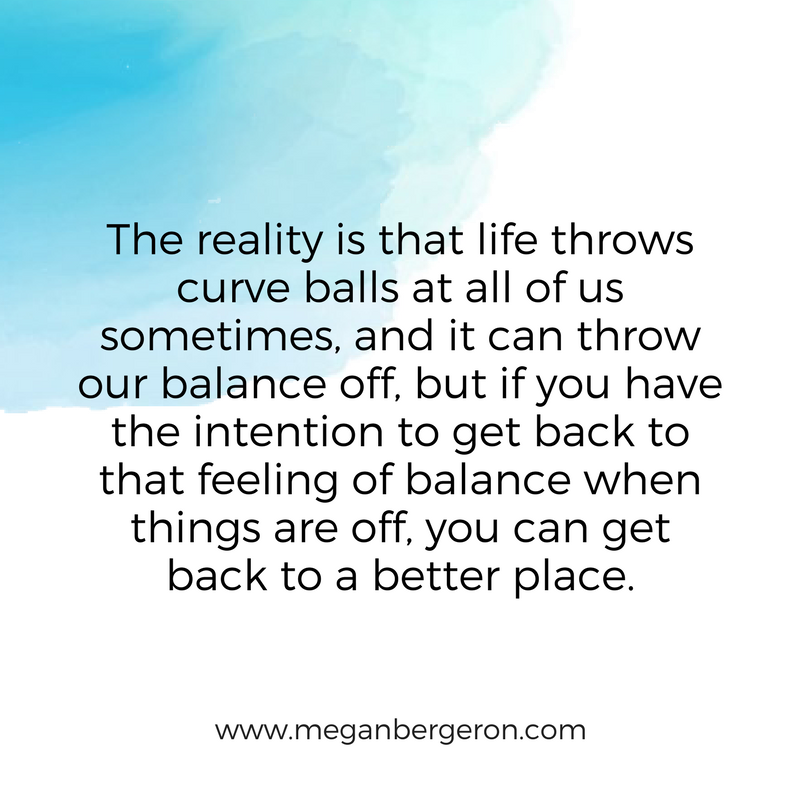 The reality is that life throws curve balls at all of us sometimes, and it can throw our balance off. But if you have the intention to get back to that feeling of balance when things are off, you can get back to a better place. 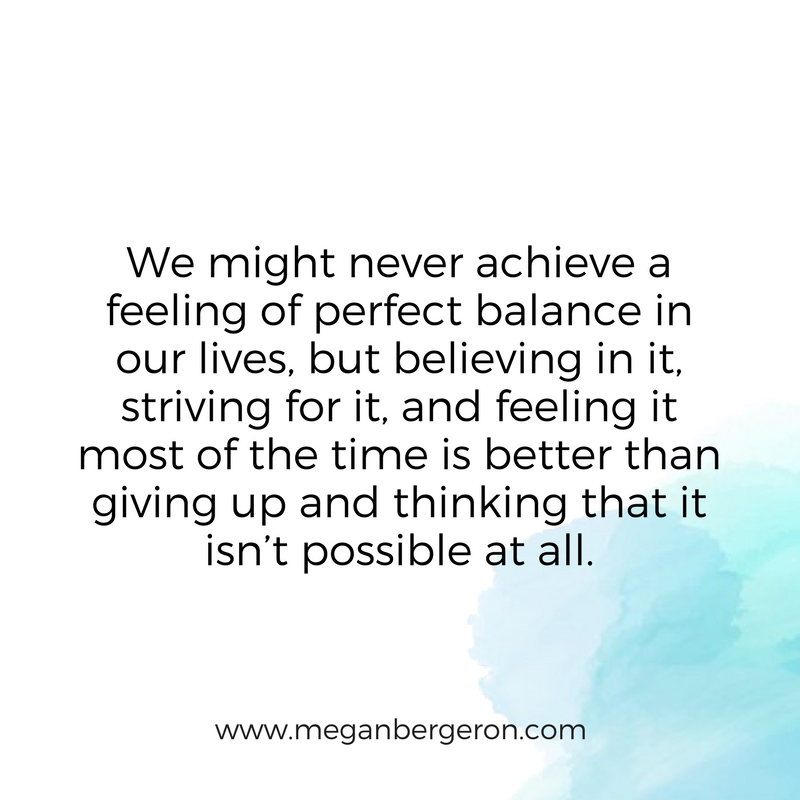 We might never achieve a feeling of perfect balance in our lives, but believing in it, striving for it, and feeling it most of the time is better than giving up and thinking that it isn’t possible at all. I hope this was helpful. If you thought it was, then please like it and share it. I’d love to know what things you do to create a feeling of balance in your life. If you liked this post, be sure to subscribe so that you can get training like this delivered to your inbox every week!